"Everyone knows that a cowboy will rope anything that moves: cattle, dogs, cats, bales of hay, unsuspecting fellow-cowboys… So, when some local goats escape their pen and turn up near Wolf Creek, Deputy Kile knows just who to ask for help rounding them up. 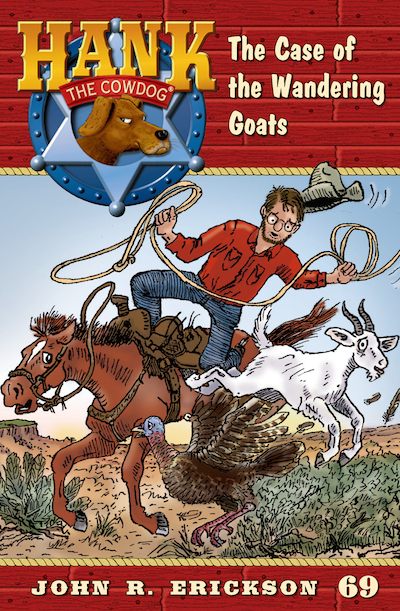 Slim and Hank spring into action and go in search of the lost goats, but who could have foreseen the dangers and surprises they’d face in the course of their rodeo rescue? Who is this mysterious and majestic sheep-king and his subjects that they find? And, what are they doing on Hank’s ranch? Will Slim and Hank manage to catch the little show-goats before night falls and the coyotes find them?" As always, we LOVE hearing what you think! Are you excited about Hank #69, AND what has been your favorite book in the series so far?